The intriguing title to We Own the Night is taken from a police badge — a street crime unit of New York’s Finest, as shown in the opening montage of real (-looking) photos of NYC police at work. But watch the whole movie and the title disappears into irrelevance. The film is just another police procedural with no hook to grab an audience. The low-key drama feels deliberate, but it’s just not gripping or stylish or exciting enough to make much of an impression. We Own the Night is about two brothers, one a cop (Mark Wahlberg) and one not (Joaquin Phoenix). One is a welcome member of a proud police family and the other isn’t. 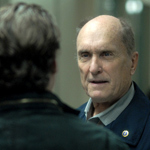 Dad (Robert Duvall) is a cop and even makes some cutting remarks in public about how proud he is of his son — singular. Bobby (Phoenix) doesn’t seem to mind being the black sheep. He runs a nightclub that’s almost legit. He has his own interests and philosophy, and he has no regrets about not following the family’s police tradition. The movie does a few interesting things with this setup. Because Bobby uses “Gray” instead of “Grusinsky” as his last name, the bad guys — drug dealers in this case — don’t realize his family connections. When the kingpin (Alex Veadov, giving a tight, creepy performance) goes after Joseph (Wahlberg), he doesn’t realize he’s messing with his friend Bobby’s brother. But anything interesting writer/director James Gray does with the material is offset by the formulaic scenes. There are many, but the most obvious is the scene in which Bobby agrees to wear a wire. The agent drills into him the standard instructions: don’t be a hero, and don’t forget the keyword for an emergency. The next scene plays exactly like you’d think it would if you’ve ever seen a police movie before. I found most of the movie to be, frankly, boring. There is a point in the movie, however, where I doubted my instinct. There is a car chase on a rainy afternoon. The camera stays almost entirely inside the cars, and the heavy rain obscures much of the expensive stunts and CGI. The sound effects are muted by the rain, and there is no adrenaline-pumping music on the soundtrack. It is one of the more interesting car-chase scenes I’ve seen in a while because it dares to break the conventions. Perhaps I was also wrong about the movie as a whole.... Perhaps Gray deliberately made the movie subdued as a way of breaking through the cop-movie genre. On reflection, that may have been the movie’s aim, but it doesn’t make the film any more interesting. On the flip side, the film is competently made, and Joaquin Phoenix is as interesting to watch as ever. His girlfriend Amada (Eva Mendes) is a beauty, and although she’s mostly there as eye candy, she’s a reasonably strong, supportive character. Wahlberg practically disappears. A friend commended Wahlberg’s “brave” decision to play such a weak character; I think my friend is giving too much credit. The film feels very personal. Moments — even if they don’t leap off the screen — still feel like they’ve been lovingly reconstructed. The film lingers too long in certain locations or on establishing shots. Considering Bobby’s last name is “Gray,” same as the writer/director, I wouldn’t be surprised if there actually were some sort of family history in the movie. But what finally convinced me that the movie doesn’t deserve a recommendation — that I wasn’t simply misreading the movie — was a conversation I had after the movie. A friend asked what it would have taken to make the movie better. We both agreed that, although it could have been worked into an ironic tragedy or a tense thriller, it wasn’t close enough to either that a few better decisions would have helped the film. The script itself is so thin, bland, and formulaic that the project was probably doomed from the start. If you go, you probably won’t hate We Own the Night. But that’s because you probably won’t feel much of anything about it.